Whether you’re looking for a professional marley dance floor for your studio or searching for something to use for social dancing at weddings and events, we’ve got you covered. 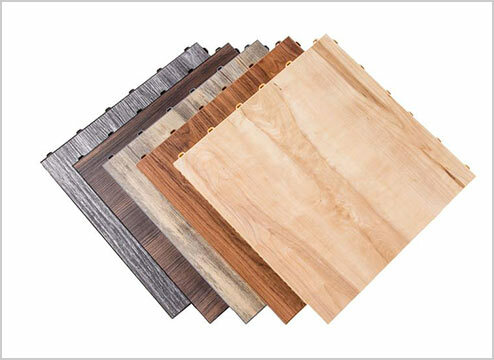 Check out our dance flooring options and discover which choice is best for you. Hello. So, you need to buy a dance floor? One moment while I get out my crystal ball and proceed to blow your mind with everything I know about you. You need to purchase a dance floor. You're a dancer - you know the lingo, you’ve danced on many a dance floor, but you have basically zero idea how to actually purchase the stuff. You are incredibly impressed by my fortune teller abilities. Super impressive, am I right? Okay, but seriously, I danced, taught and choreographed for years. I knew that everyone uses marley floors (or what they refer to as marley floors...more on that later). But years later, I stared at our selection of dance flooring and had no idea which option to choose. Well, that’s what I’m here to help you with. You can just consider me your dance flooring personal shopper. Here, you will find all the info you need to avoid the Paradox of Choice. 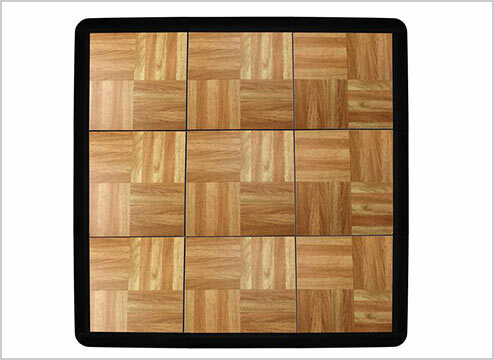 Dance floor tiles are most popular for social dancing and at-home practice spaces. The great thing about using tiles is they come together in a snap and they are ultra portable so you can move them around as you need. Do you do weddings and events? You will save a boatload of money by purchasing your own portable dance floor tiles upfront rather than continuing to rent them for every event. Dance tiles. What are they good for? I’ll tell you. Price can be limiting for large spaces. Dance tiles are more expensive than options like marley. This isn’t a big deal if you’re putting up a dance floor for a wedding, but if you try to fill a 1,000 square-foot studio...ooof. They're not as versatile as marley. 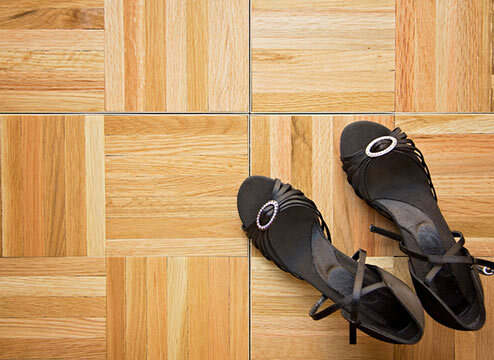 While marley rolls are great for virtually every style of dance, dance tiles are usually more suited for social dance or as a very small practice space for other styles. 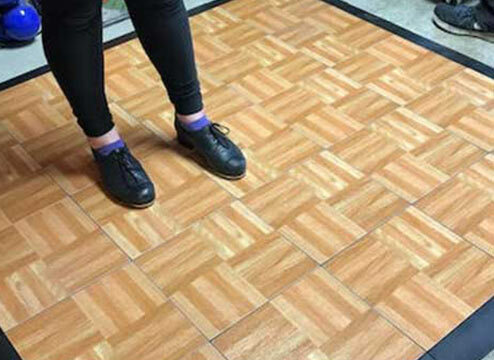 Think dance floor tiles might be your jam? Let’s chat a little about your options. These tiles are super popular for weddings and events. When I think of the perfect home setup for our Modular Grid-Loc Tiles, I imagine a basement or den area that you want to use as a family space, but also for dance practice and/or some at-home cardio/yoga/pilates. 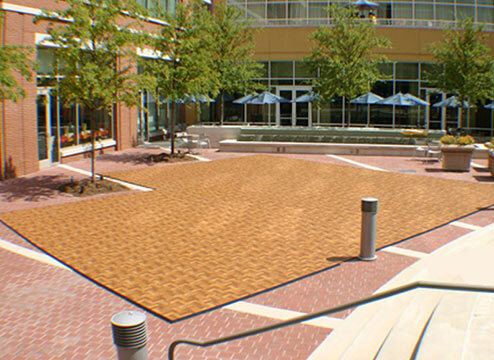 They’re also great for commercial spaces for yoga, pilates, social dance, aerobics and more. Our Dance Tiles are a little bit of a step up from the Modular Grid-Loc Tiles. They have a little more of a realistic wood-and-stone look and they have the benefit of being 100% waterproof. Like our Modular Grid-Loc Tiles, our Dance Tiles are most popular for weddings and events, as well as a basement or den area that you want to use as a family space and for dance practice and/or some at home cardio/yoga/pilates. They’re also great for commercial spaces for yoga, pilates, social dance, aerobics and more. What makes these babies deluxe? It’s true, there is quite a big price jump from our original Dance Tiles. But, although they’re designed for the same space and styles, they come with a whole lotta upgrades! 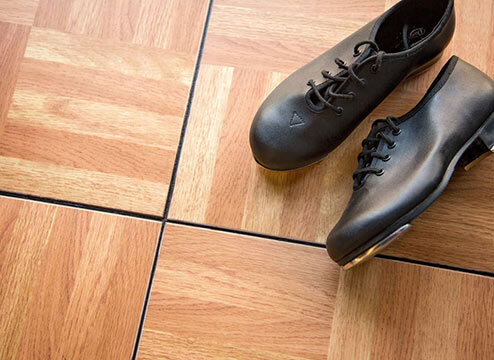 Dance Tiles - Deluxe are best for tap dance, weddings and events. The Studio Tiles are a thin vinyl marley that lays directly on the floor. This means you need a perfectly flat subfloor. Additionally, because there is no sprung subfloor or anything between your dance tile and regular ceramic tile, you don’t want to do a lot of jumping on them. 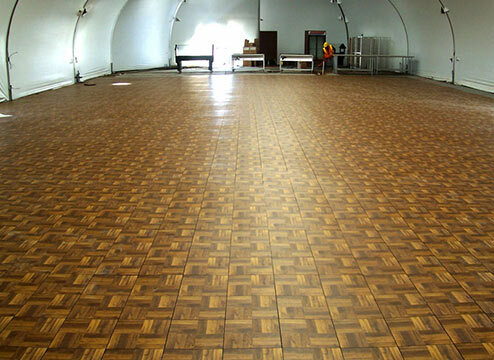 Vinyltrax Dance Tiles are best for weddings and events. 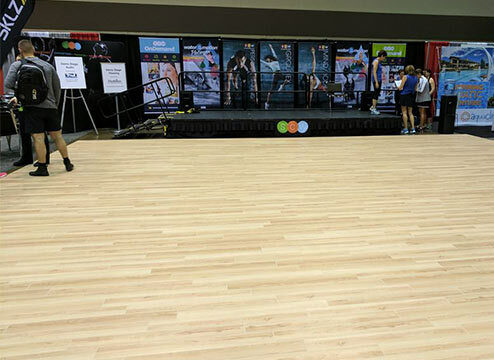 Plank Flex Dance Tiles are best for tap, weddings and events, and aerobics. Portable dance floor kits are an easy, relatively inexpensive option perfect for practicing tap, turns, ballet barre, centre and adagio and more. There’s not a whole lot of bad things to say about these rock stars, but of course, they’re not perfect for everything. 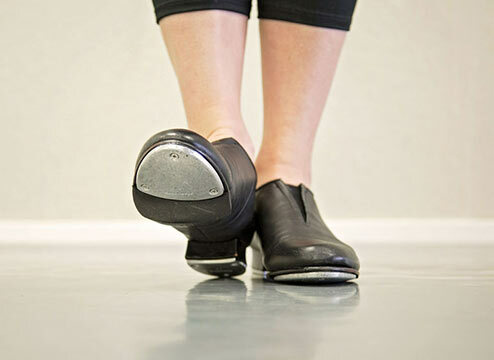 Maybe you want to practice your tap dance at home? Or maybe you teach a small social dance class in a community space and you just need a temporary floor you can easily put down and take apart? Dance Floor Kits are best for tap, weddings, events and aerobics. However, you can use them as a practice space for other dance styles, as well. Okay, so this is the studio dancer’s practice floor. This is the thing Teenage-Me always dreamed of as I actively sought after any open non-carpeted space to practice my pirouettes. Additionally, it was specifically designed for dancers with extra resiliency similar to what you would get on a sprung floor. This means you can also practice your petite allegro at home without worrying about the extra stress on your joints that typical home flooring can cause. I’m going to tell you a little secret. What we consider “marley” these days isn’t truly marley. I know, I know. I’ve been confused about this for years, apparently. What we refer to as marley rolls are, instead, vinyl rolls that mimic the original Marley flooring. It’s kind of how we still call off brands of tape "Scotch tape." The brand name became such a popular staple that it caught on as the generic term. Our vinyl "marley" rolls are made out of the same material and give the same slip control, but they’re all technically just vinyl rolls. Marley-style dance flooring rolls are definitely the big guys in dance flooring. Let me tell you why. Best slip-resistance / grip: It is the safest option for turns and jumps. No wood floor will ever be able to compare. Super easy installation: Roll, tape, voila! Below, you’ll find a description of each roll, which styles it’s best suited for, how portable it is and how much it costs. That way you can decide exactly which marley roll is best for you. The thin, lightweight, medium-fast speed Adagio Tour rolls are excellent for tap - offering slip control without muffling the sounds. 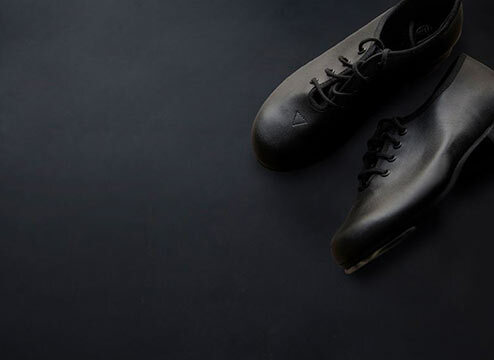 They are also super versatile, making them great for ballet, jazz, contemporary and more, as well. The Dance Floor rolls are the best if you do any tours or travel. These rolls are super light and easy to install and reinstall over and over again. 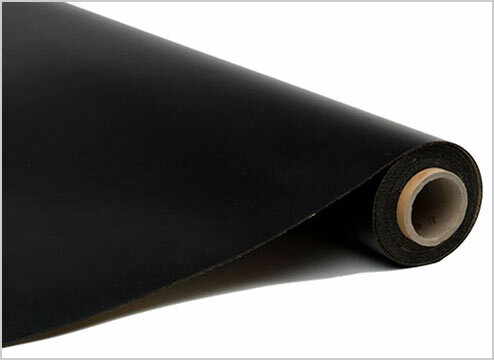 Our Dance Floor rolls are excellent for traditional styles, such as ballet, jazz, contemporary and hip hop. Roscoleum means business. Your taps, heels and most intense dance moves are no match for this thick, durable dance flooring. This does make it a little on the slower side for turns, rated as a medium speed floor. This marley roll looks great on stage or in a ballet studio. It has a good amount of grip, offering medium speed. Our impact rolls are like attaching a vinyl marley roll to a 5mm rubber underlayment. 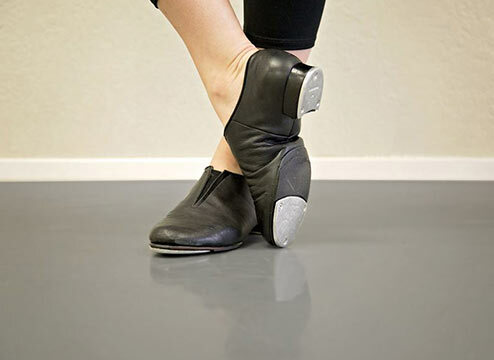 These can be especially helpful if you don’t have a dance subfloor. Dance subfloors go underneath your dance floor. 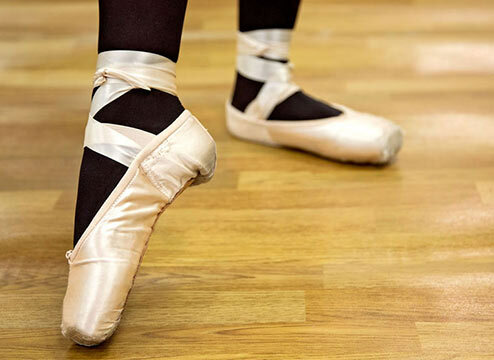 The most popular type for studios and professional spaces is sprung dance subfloors. So, why do you need dance subfloors and what the heck do they even do? 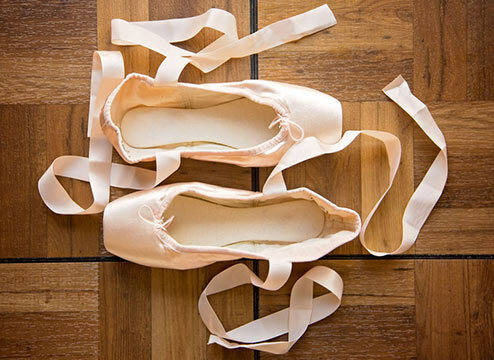 Most dancers have heard the term “sprung flooring” and at least know that it’s a great thing to have. Many know that home dance subfloors and sprung subfloors protect your joints from injuries and help absorb the impact from jumps and explosive movements. What many people don’t know is just how necessary it is. The truth is you really do need dance subfloors if you plan on dancing on these floors for multiple hours per day. 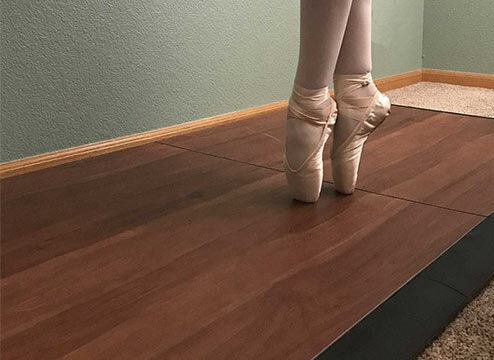 If you have a non-competitive studio with most dancers coming in for an hour once a week or a home practice space, you can choose a foam or foam and plastic dance subfloor to help save your joints and your wallet. But, for professionals, we recommend the full sprung dance subfloors. Safety: Safety is the most important. Always. Preventing injuries will keep your dancers dancing, which means less time working understudies for shows and competitions. 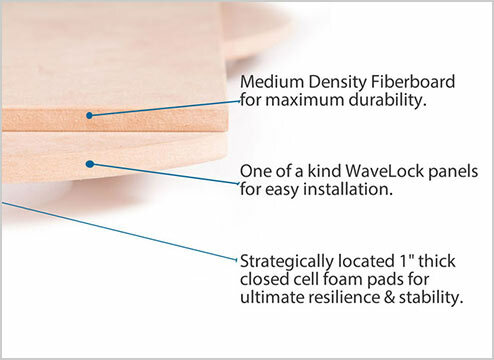 Comfort: A resilient subfloor also feels better. It makes it easier to rehearse and take class for 6 hours a day. Easy to install: You can do it yourself super easily. Attracts new students and company members: This is something that dancers look for when choosing a studio. It’s also something professionals look for when they have multiple company offers. Be the best. It pays off. Can we say none? Okay, okay, I suppose everything has some type of drawback. Extra cost: An extra cost that’s worth it, but still, an extra cost.